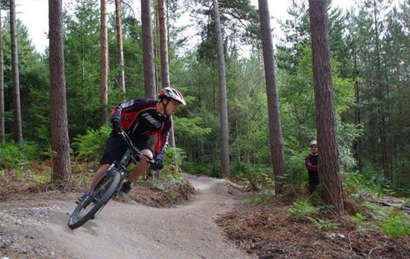 Whether it’s swinging from the trees like a monkey at Go Ape, or cycling through one of the many trails, or just admiring the beautiful scenery on foot, Bedgebury National Forest and Pinetum really does have something for everyone. Follow the regular seasonal trail around the Pinetum. The trails change with each new season and each one focuses on a new subject that brings alive the important conservation work that we carry out right in the heart of our outstanding conifer collection. The trails are suitable for all ages, interests and abilities and a free supporting trail guide can be collected from the information office before setting of on your walk through the beautiful collection. Bedgebury and National Pinetum’s orienteering routes are professionally endorsed and designed by Saxon Orienteering (affiliated to the British Orienteering Federation) to cater for all levels of expertise and experience. More available from the Bedgebury Visitor Information Office for each course around the forest. Please check with the Bedgebury Visitors Centre for the latest pricing of these. Why not download the Forestry Commission’s audio trail before your visit? The trail provides an introduction to the Pinetum and the tree collection. You can listen to former curator of the Pinetum, Chris Reynolds, as he shares his passion for the tree collection. Come on an adventure – find the Gruffalo and the Gruffalo’s Child! You may find the fabulous Gruffalo character sculptures hidden in the Pinetum! And now he has been joined by the Gruffalo’s Child and friends too! And why not download the free Gruffalo activity sheets before you go on your adventure so you can learn more about leaves and seeds as you go. Sign up to find out more about Gruffalo fun with the Forestry Commission. There is now table tennis at Bedgebury. Bring in your own bat and balls, or use ones at Bedgebury, and challenge your friends to a game or two on outdoor table tennis situated in the play area. Use of the table tennis table is FREE. 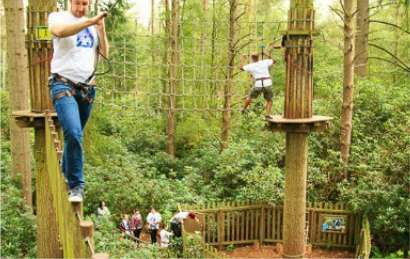 Swing between the trees like a monkey at Go Ape.